So I’m now pretty much a permanent glasses wearer. After getting my prescription updated I’ve come to realise I should really be wearing my specs all the time, not just for driving. Luckily My Optique offered to send me a new pair of glasses to review, and I love them! I’ve been wanting a pair of geek frames for a while, and these ones match that description perfectly. Not too big or thick, I love these Westminster frames by London Retro. Even though they say they are mens style, I find they fit me just find, and I have been wearing them daily without any problems. This is an outfit I wore to work last week, featuring my new dress from AX Paris. 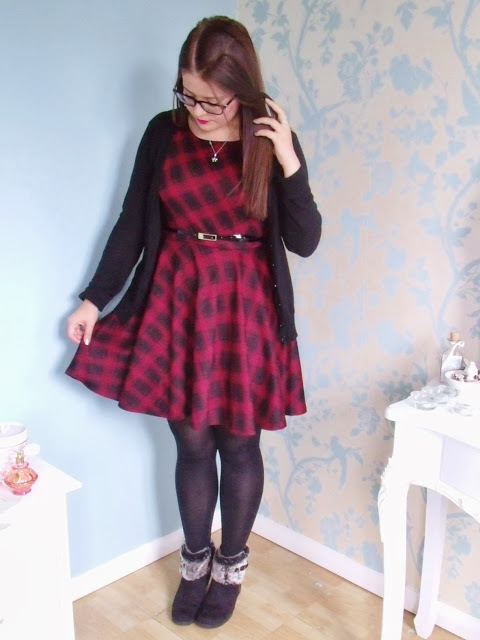 This tartan skater dress looks great with a skinny belt and black tights for winter. 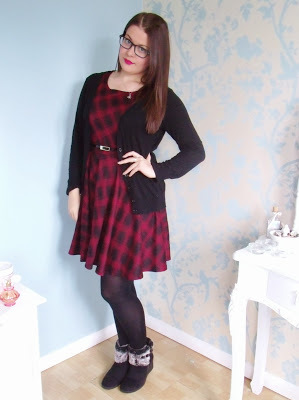 I’m absolutely obsessed with tartan this season, so this is very much loved by me. What I love most about this dress is the quality and feel of it. I was slightly expected a normal thin jersey dress, but it’s actually got a super soft feel to it and it’s really nice and thick, perfect for winter. I also wore my new ankle boots (post coming soon!) along with a knitted slouchy cardigan to keep warm. These aren’t the most flattering photo’s in the world, but I’m really struggling with getting decent blog photos recently because of the horrible dark weather! 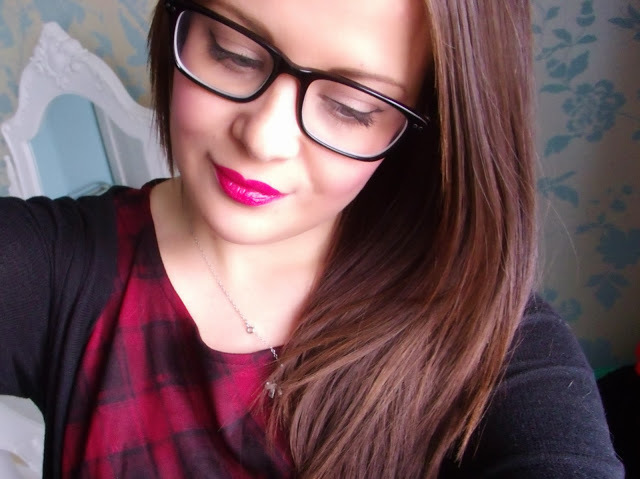 I’ve got my new lipstick on too, which will also be coming soon in a new post. as a permanent glasses wearer, i understand. your glasses look very nice on you! love your outfit! tartans rock! They really suit you! I keep meaning to sort out my glasses too, it's one of those things I keep putting off! Welcome to the 24/7 glasses club! I really want some glasses like yours, but I don't think I'd pull them off like you! The glasses look so good!! As do your eyebrows, I'm not sure if it's because the glasses make them stand out, or if they're ridiculously well groomed? !